AS he walked out, holding his face in his palms, tears in his eyes, I. M. Vijayan must have thought it was a lot easier to tackle difficult situations on the field. But emotions can be tricky. In particular the feeling that he would no longer do duty for India, which he had served with distinction, rankles him. He had decided that the Afro-Asian Games was his last international outing. Every player has to leave the scene one day, however good or bad he is, but great players it is said fade away leaving memories. Vijayan belongs to that category. Fittingly Vijayan would not have asked for a better farewell, finishing top scorer and more importantly when he could still excel in the role of a `fox in the box' as Coach Stephen Constantine prefers to call him for his outstanding abilities. Yes, a gold medal finish would have been the icing in the cake, the most appropriate gift from his colleagues. That was also the plan but not often do good intentions bring the right end. Vijayan will always remember that Friday night at the Lal Bahadur Stadium with a tinge of sadness. Three more years of club football is what Vijayan, now 34, gives for himself as a footballer and thereafter he plans to devote all his energy and time for his Academy in his home town, Thrissur. Given his dedication and hardwork, qualities that pitch forked him to top level football in the country and with success, Vijayan should carve a niche for himself in his new innings. For, he knows what it is to survive, what it is to be on an empty stomach and what the travails are of one not sure of his next meal. That has been the saga of his life, from the depths of poverty to rise and become one of the proudest footballers of Kerala and India. His hard work has paid. Not for nothing is he the first footballer from Kerala to win the Arjuna Award apart from being the `Best footballer of the year' in 1993, 97 and 99. I.M. Vijayan, the deadliest strikers in Indian football. He is aggressive and plays from any position. He used to sell bottles of soda in the Trichur Municipal Stadium, earning 10 paise a bottle. Today the school dropout is the highest-paid footballer in the country. Dodging defenders, dribbling and sprinting with the ball as if it were glued to his feet, I.M. 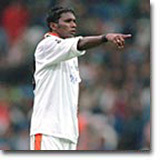 Vijayan is a fearsome striker. The man with the Golden Boot (in 1993 he was awarded a golden boot by Malayala Manorama for the best football player in the Santosh Trophy) has metamorphosed into a Stealth Bomber. The moment he breaks through a cloud of defenders panic grips the opposition. They scream at each other to stop him and snap around his legs. But in those few seconds he positions himself and kicks a scorching shot at the goal. FC Kochin's (FCK's) technical director, George Blues, says: "Out of five such chances that he creates you can be sure two will find the mark." The crowd goes into a frenzy the moment he gets the ball. Naimuddin, national coach, who polished Vijayan's skills, says he is a natural player. "If he puts on muscle mass and becomes sturdy and fitter," says the coach, "he can create havoc anywhere." I.M. Vijayan is a total footballer, powerful and fleet-footed, he has good body movements, excellent ball control, is superior in one-on-one situations, has the ability to get around defenders easily, and is a natural and accurate striker. More important, he is a team player and a match-winner. He is not afraid to play in the mid-field or in the defence. Off the field he is self-effacing. After winning against Mohun Bagan in the Durand Cup he immediately rushed to the opposition's bench to commiserate with them. When FCK lost to Bagan in the semi-final of the DCM tournament he was, again, the first one to congratulate them. Football has been the soul of his life. Plucked from the streets of Thrissur for his innate talent by M. K. Joseph, the former Kerala DGP, a great lover of sports and sporting excellence, and tuned thereafter by coaches T. K. Chathunny and Sridharan for the once formidable Kerala Police team, the 17-year-old was soon to become a phenomenon starting with the 1987 Quilon Nationals. His thin frame, expressive eyes and rugged looks hardly made him appear like a footballer. But the wiles he shows, the cunningness he exhibits and opportunism that he cashes on made him a hit. "Vijaya to start with and then Vijayetta later", fans in Kerala loved to both hate and adore him in turns. When he left Kerala seeking greener pastures in Kolkata Club football (Mohun Bagan), fans chose to decry him. He became the `darling Bijoyan' in Bengal and that took his fame to the national level. When he returned later to Kerala fans adored him. Today they follow every move of his, even made his debut in film a success by their all round support. Vijayan has played for India in various tournaments starting with the Nehru Cup, pre-Olympics, pre-World Cup, SAAF Cup, SAF Games, Sahara Cup, various friendlies and he had made an impact in everyone of them. "I do not know how many goals I had scored till date", he would confess in humility but goal-scoring has been his pastime. An able foil for Bhaichung Bhutia, there were efforts to compare the two but he would be the first to say, "Bhutia is special" to kill any arguments. The two have the best of relationship and that extends beyond the field. Yet another with whom he has a special relationship is his Thrissur mate Jo Paul Anchery. The two in fact move together in all ventures. The label of a noted player wears lightly on his shoulders. For, he remains a down to earth footballer who has not forgotten his roots. He respects all those who were with him in his childhood days and if there is one thing he will cherish, it is to ensure that his mother no longer struggles for a living. In fact she lives in the comfort of a lovely house he has built. Today he has no regrets in life. He has a family, wife and three children. Only challenges remain in the form of making the Academy, a centre of note. Maybe like the footballer he was, he would be able to show his capability in bringing to the game another Vijayan, befitting his calibre. On that hope begins another saga for this classy player.